He’s not the first to ask that question. The line of owners who doubt whether social media is right for their businesses, honestly, is quite long. And my answer is always the same. I don’t know why you or your business should spend any time on social media. I really don’t. But, let’s ask your customers where they spend their time. While we’re at it, let’s ask your competitors, too. And that’s where the conversation over breakfast becomes tricky because the next part of my answer is this: It really doesn’t matter whether you or me, as the business owner, “get” social media. It’s not important that you understand how to post updates on Facebook, or that you know how to retweet on Twitter, or that you’ve never watched a video let alone uploaded one or subscribed to a friend’s channel on YouTube. What matters more — or should — is this: Your customers “get” social media. Increasingly, so do your competitors. Don’t take my word for this. The Nielsen Company, the same market research firm that tracks television use, reported in April 2010 that 73 percent of U.S. residents use social media at least once a week. That was nearly a year ago. Online use hasn’t slowed since. In the same report, Nielsen said Facebook rivals the reach of traditional media: 47 percent of Americans visit Facebook daily. That compares to 55 percent who watch TV, 37 percent who listen to radio, and 22 percent who read newspapers. The average Facebook user spends slightly more than seven hours a month on the social networking website, Nielsen reported last month. So here are my questions back to business owners: What else do your customers do for seven hours a month? Then, what could your business do with and for your customers during some of those seven hours each month? How can I meet and talk with customers online? What can I do to help them online? Your competitors are finding ways to answer these questions. Again, you don’t have to believe me. But how about Bloomberg and Business Week? They reported on Nov. 30 that 67 percent of U.S. companies had adopted social media in the past 18 months. In February, Merchant Circle, an online network of local business owners, reported that 70 percent of local businesses use Facebook — up 20 percent over 2010. Another 40 percent of these business owners said they use Twitter, a social communication website, to connect with customers. For the first time, businesses also said they use Facebook more than Google (search rank or ads) for online marketing. If your competitors are not using social media, what can your business do to get there first? If your competitors are using social media, what can you differently or better? These are not the answers that owner wanted to hear. But tell me this: When do customers or competitors ever do what we want them to do? That’s rarely how it works — in person, or online. Chris Celek, owner of Celek Media Consulting in Springboro, helps small businesses meet and build relationships with customers with websites, social media and other digital communications. More information: chriscelek.com or chris@celekmedia.com. 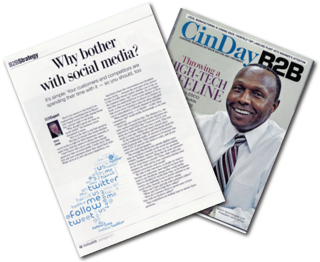 This article appears in the July-August 2011 issue of CinDay B2B, which is distributed to about 3,000 business leaders in Cincinnati and southwest Ohio. Thanks to Editor Ron Rollins for the opportunity to share these ideas with you. This entry was posted on Thursday, July 7th, 2011 at 9:56 pm and is filed under Business, Customers, Facebook, Linkedin, Social Media, Twitter, You Tube. You can follow any responses to this entry through the RSS 2.0 feed. Both comments and pings are currently closed.